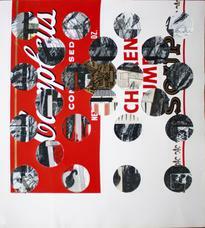 Ray Johnson, Untitled (Campbell's Soup with Cut-out Circles), 1973-1988. Ray Johnson, Untitled (Five Snakes, Jimmy Connors), 1975. Ray Johnson, Cupid with Tender Button, 1976. Opening reception Thursday November 6, 5:30-7:30pm. Richard L. Feigen & Co. is pleased to present Ray Johnson's Art World, on view November 7, 2014 through January 17, 2015. 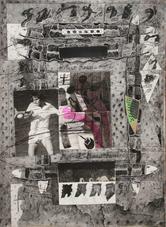 The exhibition pairs Johnson's collage and mail art with works by his contemporaries John Baldessari, Lynda Benglis, Chuck Close, Jasper Johns, Robert Rauschenberg, Ad Reinhardt, James Rosenquist, Edward Ruscha, Yoko Ono, Andy Warhol, and May Wilson. Ray Johnson's Art World provides a window into Johnson's complex verbal and visual language, and reveals the ways in which Johnson's work parallels and confronts the work of his fellow artists. The exhibition will be highlighted by original works by these artists, including John Baldessari's Blasted Allegories (1978), an exploration into the complex structure of established rules and conditions governing the use and practice of image as language; original documentation of Lynda Benglis's controversial 1974 Artforum spread, along with her sculpture Parenthesis (1975), consisting of two cast aluminum dildos in a velvet lined box; Yoko Ono's Cut Piece (1964), filmed by the Maysles Brothers, a performance in which the audience can approach her with instructions to use a pair of scissors to cut her dress; an original Andy Warhol, Large Cambell's Soup Can, from 1964; and an important early collage by James Rosenquist, A Drawing While Waiting for an Idea (1966), which represents an Eastern philosophical turn in Rosenquist's thought. These works and many more will be shown alongside Johnson's independent exploration of the concepts, practices and interests he shared with his contemporaries and friends. The exhibition is designed to complement Elizabeth Zuba’s Not Nothing: Selected Writings by Ray Johnson, 1954-1994 (Siglio Press), a collection of over 200 unpublished writings that provides a textual parallel to Ray Johnson’s Art World. The exhibition will be accompanied by a catalogue featuring an essay by Zuba. Read the exhibition catalogue essay by Elizabeth Zuba here. "Always on His Own Terms: Ray Johnson Defies Categories 20 Years After His Death" by Randy Kennedy for The New York Times, January 8, 2015. "When Mystery Keeps Works New: Jasper Johns and Ray Johnson on the Upper East Side" by Roberta Smith for The New York Times's "Last Chance" feature, January 15, 2015.